This was my fourth b-day, Feb 3, 1962. 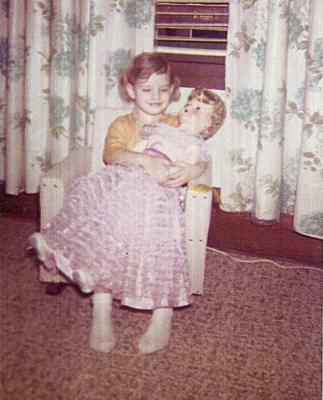 I still have the little chair too, but can't tell you anything about the doll. Kind of hoping someone might be able to tell me something about it. She's missing her shoes (not unexpected) and the front of her dress needs repair, but it's fixable. Brenda, go to EBAY and look up 300412061076. Read the description left on this site. Then see the following dolls also. If you do searches on EBAY, you might find more like yours. Join in and write your own page! It's easy to do. How? Simply click here to return to Family Picture Dolls.